Messiah holds a unique place in the affections of choral singers in the English speaking world. Its greatest choruses are among the most popular pieces of music ever written and is shrouded in tradition and probably more than a little myth, especially surrounding the famous Hallelujah chorus. Handel is reputed to have sobbed as he completed it saying: “I did think I did see all Heaven before me and the great God himself”. During its London premiere in 1743, King George II rose to his feet at the start of the Hallelujah chorus and remained standing until the end, a tradition that is followed around the world today, even in fervent republics such as the United States of America. Another tradition is performing Messiah to raise money. 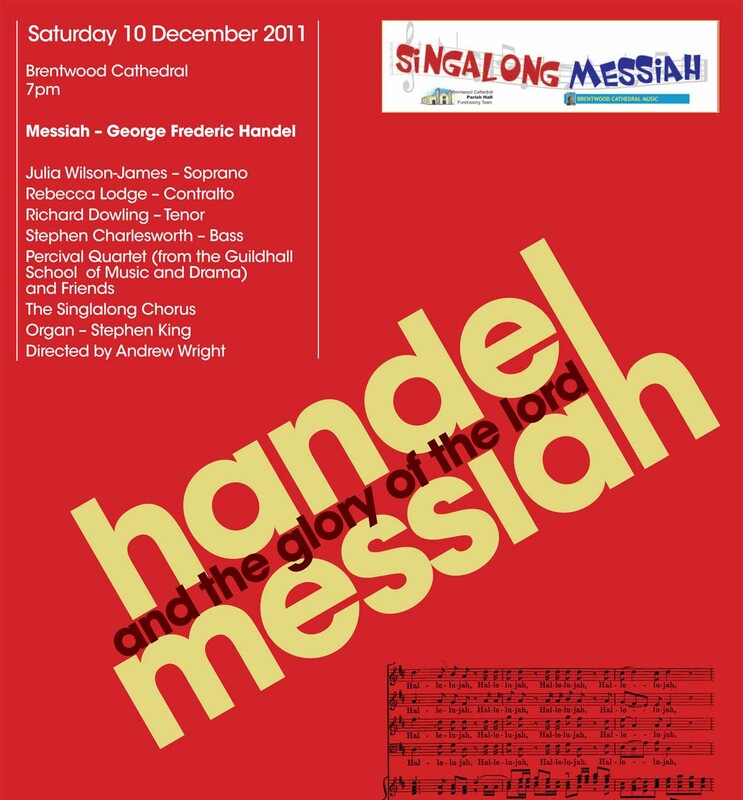 Handel gave many performances to aid the Foundling Hospital and just 40 years after its composition the famous 18th century musicologist Charles Burney wrote: “This great work has been heard in all parts of the kingdom with increasing reverence and delight; it has fed the hungry, clothed the naked, fostered the orphan and enriched succeeding managers of the oratorios more than any single production in this or any other country”. Just what is it that makes Messiah so special? To answer this question it is necessary to understand a little of the background of Handel’s career. He was born in 1685 and trained in Germany but spent some of his early musical career in Italy where he became familiar with the Italian style of dramatic religious cantatas, popular at the time because the Pope had banned operas. He returned briefly to Germany before settling in London in 1712, becoming a British citizen ten years later. His early career in England was devoted to composing Italian operas which were hugely successful until the 1730s when musical fashion suddenly changed, rejecting them in favour of a simpler English style pioneered by The Beggar’s Opera . Handel’s response was to turn his hand to oratorios based on Old Testament themes such as Esther, Deborah, Saul and Israel in Egypt. These were moderately successful but by the early 1740s he was at a low ebb with financial problems and in poor health following a stroke. He was in his mid-50s and decided to try something new, an oratorio with a New Testament theme and, also, without the direct narrative of his previous works. The result was a work that can probably best be described as a dramatic meditation on the meaning of Messiah. Handel brought to bear his early experiences of writing religious music in Italy and his years of composing operas to create a piece that was vivid, dramatic and instantly memorable while capturing the religious nuances of the biblical texts that Charles Jennens selected. This was actually to be Handel’s final project with Jennens as they fell out very publicly over some of the musical treatment of the text. It is written in three parts. Part I deals with Advent and Christ’s birth and opens with a Sinfonia, much as an opera would have had an overture. This immediately brings in the tenor soloist with ‘Comfort ye’ and ‘Every Valley’, an aria that Handel uses to show off all his skill in painting pictures with music. The phrases rise to the top of each peak and then drop down deep into the valleys before repeated notes help the listener appreciate how the rough places have indeed been made plain. This is Handel the opera composer at his best. The first chorus ‘And the glory of the Lord’ deals with the prophesy of Christ’s coming and sets the optimistic and upbeat tone for the rest of Part I which also includes ‘For unto us a child is born’, a piece that was recycled from an earlier opera where it was a duet for two sopranos. It is one of five movements re-using music from his Italian operas. Part II takes us to the Passion story and immediately strikes a more sombre tone with the opening chorus ‘Behold the lamb of God’ and the alto aria ‘He was despised and rejected’., a haunting lament. The Passion, of course, takes us through to the resurrection and this section ends with the resolutely triumphant ‘Hallelujah’ chorus. The final section is the shortest and it focuses on the redemptive message of Christ’s life, death and resurrection. It does, however, contain some of the most dramatic music as Handel strives to deliver his vision of the Christian faith. It opens with a gentle soprano solo ‘I know that my Redeemer liveth’ and has as its centrepiece the robustly exultant bass aria ‘The trumpet shall sound’. The final chorus ‘Worthy is the lamb’ is monumental and very demanding at the end of such a long work. Its concluding fugal Amen – almost 100 bars long – is one of the greatest choral finales in all religious music. Messiah is one of the few works of the Baroque era that has never had to be rediscovered for the simple reason that it has never fallen out of the repertoire. It has been re-arranged by many people, including Mozart, Vincent Novello and Sir Thomas Beecham, all of whom added to the orchestral parts but rarely touched any of the choral writing. Recent years have seen a swing back to performing editions and orchestrations that are closer to those used in Handel’s time, some of them using chamber choirs and very small orchestras. This is an topic of constant debate among musicologists. Often, the early performances were in large theatres and would have required substantial forces and certainly within a few years of Handel’s death there are records of performances employing upwards of 300 singers. Handel himself conducted Messiah many times and was always wonderfully pragmatic, frequently re-writing parts of it to suit the range and capabilities of the forces available. This is one of the reasons why there is no such thing as a truly “authentic” version of Messiah. It is a testament to the brilliant accessibility of Handel’s music that its inspiration shines through, almost however it is performed.